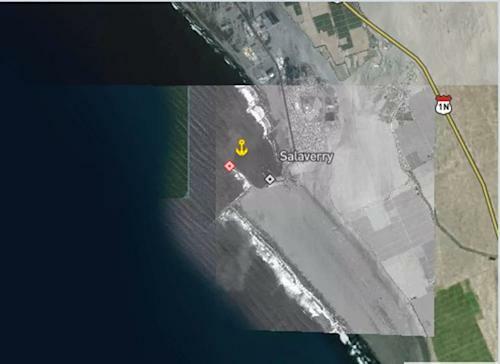 As The Company progresses in preparation for extracting, transporting, and loading of coal, we wish to provide information to our valued investors of the strategic port of Salaverry, is located 17km from the city of Trujillo. Latitude -8º -9' -54' S, Longitude -79º 0' -38' W.
Its Cargo Pier water depth meets our demands for coal shipments at 31 - 35 feet (9.4 - 10 meters). Tide information is updated daily. Tug assist is on-ready, and quarantine stations with Deratt Cert (Ship sanitation certification) is present. Air, Radio, and Telephone communications are on-ready. It is a major port and has met our potential client demands for Ship repairs, with refueling oil and diesel oil, water/provisioning/engine maintenance. Loading of the coal will be done in wharves and on-anchor. Mobile cranes and 24 ton Lists are available for AIM. There are neither tide entrance restrictions nor overhead limits. The Company has studied and consulted with its advisors, clients, and the port, and are pleased that the port is appropriate for year round loading and can provide year round shipping of coal. This efficiency allows the Company to provide coal in a cost effective, and nimble on-demand manner. Coal supply chain approach is how the Company manages its availability. We are developing clear metrics highlighting our coal inventories at mines and the Port, the arrival date of vessels, the amount of coal being shipped from our mines. The port is ready for coal shipping; cargo shipping constitutes 42% of its monthly usage. AIM is positioned to ship 2 to 4 shiploads of anthracite coal per month, currently the spot price exceeds $250.00 MT. "Anthracite is necessary for steel and high-grade metal forging products. The prices currently range between $220 - $400USD per ton, and we have been monitoring the open-market prices, on sxcoal.com and alibaba.com, and they have been on the rise month over month. As the economy expands and with energy demands of G8 and emerging markets are unilaterally in line, we do not see this trend to plateau, rather it is continuing to put price pressure on un-replenishable energy resources," says JR Todhunter, President and CEO of AIM. As of 2016-12-08 15:39:00 China Nov coal imports hit 23-month high of 26.97 million tonnes in November, up 24.96% from October. Figures and charts are available in image links or via our twitter account. Please click or copy/paste on the links in this news releases for pictures of the port. Comprehensive pictures and supplemental information is viewable upon opening the link to the PDF and Word document. Thank you. The Company is an Anthracite coal mining and exploration company and plans to mine 1,000 hectares of land. We have expertise in business, mining, and legal with our distinguished board of directors and advisory board. We have amicable relationships with all parties involved in mining in Peru. We are a SEC reporting publicly traded company with the symbol (AEXE). Certain information set forth in this press release contains "forward-looking statements" and "forward-looking information" under applicable securities laws. Except for statements of historical fact, certain information contained herein constitutes forward-looking statements, which include management's assessment of future plans and operations and are based on current internal expectations, estimates, projections, assumptions and beliefs, which may prove to be incorrect. Some of the forward-looking statements may be identified by words such as "estimates," "expects," "anticipates," "believes," "projects," "plans," "targets," and similar expressions. These statements are not guarantees of future performance and undue reliance should not be placed on them. Such forward-looking statements necessarily involve known and unknown risks and uncertainties, which may cause AIM's actual performance and financial results in future periods to differ materially from any projections of future performance or results expressed or implied by such forward-looking statements.